The scrollbar-color property controls the twoo colors of a scrollbar: the thumb color and the track color. scrollbar-color is part of the CSS Working Group's Scrollbars Module Level 1 draft, which is still a work in progress as of this writing. 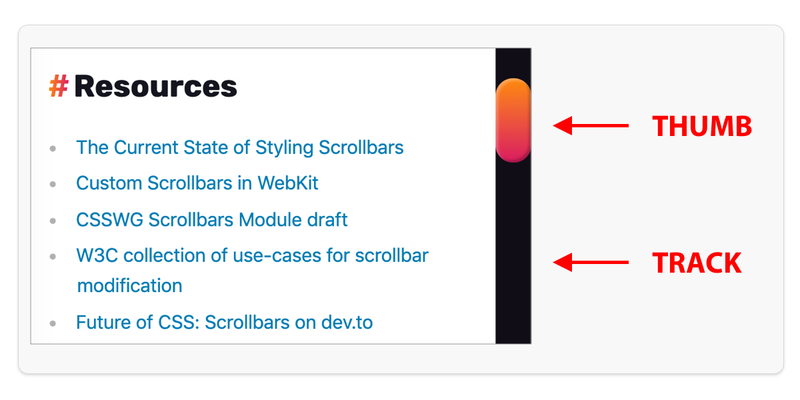 scrollbar-color will also accept values of dark and light to match a user's preferences if they're using something like dark mode on Mac OSX. As of March 2019, support for dark and light values is not available in any browser. <color> is supported in Firefox. See the browser support section below for details. auto is the default value and will render the standard scrollbar colors for the user agent. dark will tell the user agent to use darker scrollbars to match the current color scheme. light will tell the user agent to use lighter scrollbars to match the current color scheme. <color> specifies two colors to be used for the scrollbar. The first color is for the "thumb" or the moveable part of the scrollbar which appears on top. The second color is for the "track" or the fixed portion of the scrollbar.